"You Will Have No Protection"
My heart is breaking; but I do not mind. For one thing, as soon as I wrote those words I was able to weep. Which I had not been able to do since learning of the attack by armed Israeli commandos on defenseless peace activists carrying aid to Gaza who tried to fend them off using chairs and sticks. I am thankful to know what it means to be good; I know that the people of the Freedom Flotilla are/were in some cases, some of the best people on earth. They have not stood silently by and watched the destruction of others, brutally, sustained, without offering themselves, weaponless except for their bodies, to the situation. I am thankful to have a long history of knowing people like this from my earliest years, beginning in my student days of marches and demonstrations: for peace, for non-separation among peoples, for justice for Women, for People of Color, for Cubans, for Animals, for Indians, and for Her, the planet. 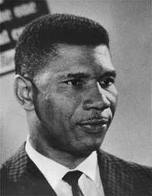 I am weeping for the truth of Medgar’s statement; so brave and so true. I weep for him gunned down in his carport, not far from where I would eventually live in Mississippi, with a box of t-shirts in his arms that said: ‘Jim Crow Must Go.’ Though trained in the United States Military under racist treatment one cringes to imagine, he remained a peaceful soldier in the army of liberation to the end. I weep and will always weep, even through the widest smiles, for the beautiful young wife, Myrlie Evers, he left behind, herself still strong and focused on the truth of struggle; and for their children, who lost their father to a fate they could not possibly, at the time, understand. I don’t think any of us could imagine during that particular phase of the struggle for justice, that we risked losing not just our lives, which we were prepared to give, but also our children, who we were not. Nothing protected Medgar, nor will anything protect any of us; nothing but our love for ourselves and for others whom we recognize unfailingly as also ourselves. Nothing can protect us but our lives. How we have lived them; what battles, with love and compassion our only shield, we have engaged. And yet, the moment of realizing we are truly alone, that in the ultimate crisis of our existence our government is not there for us, is one of shock. Especially if we have had the illusion of a system behind us to which we truly belong. Thankfully I have never had opportunity to have this illusion. And so, every peaceful witnessing, every non-violent confrontation has been a pure offering. I do not regret this at all. When I was in Cairo last December to support CODEPINK’S efforts to carry aid into Gaza I was unfortunately ill with the flu and could not offer very much. I lay in bed in the hotel room and listened to other activists report on what was happening around the city as Egypt refused entry to Gaza to the 1400 people who had come for the accompanying Freedom march. I heard many distressing things, but only one made me feel, not exactly envy, but something close; it was that the French activists had shown up, en masse , in front of their embassy and that their ambassador had come out to talk to them and to try to make them comfortable as they set up camp outside the building. This small gesture of compassion for his country’s activists in a strange land touched me profoundly, as I was touched decades ago when someone in John Kennedy’s white house (maybe the cook) sent out cups of hot coffee to our line of freezing student and teacher demonstrators as we tried, with our signs and slogans and songs, to protect a vulnerable neighbor, Cuba. Where have the Israelis put our friends? I thought about this all night. Those whom they assassinated on the ship and those they injured? Is “my” government capable of insisting on respect for their dead bodies? Can it demand that those who are injured but alive be treated with care? Not only with care, but the tenderness and honor they deserve? If it cannot do this, such a simple, decent thing, of what use is it to the protection and healing of the planet? I heard a spokesman for the United States opine at the United Nations (not an exact quote) that the Freedom Flotilla activists should have gone through other, more proper, channels, not been confrontational with their attempt to bring aid to the distressed. This is almost exactly what college administrators advised half a century ago when students were trying to bring down Apartheid in the South and getting bullets, nooses, bombings and burnings for our efforts. I felt embarrassed (to the degree one can permit embarrassment by another) to be even vaguely represented by this man: a useless voice from the far past. One had hoped. The Israeli spin on the massacre: that the commandos were under attack by the peace activists and that the whole thing was like “a lynching” of the armed attackers, reminds me of a Redd Foxx joke. I loved Redd Foxx, for all his vulgarity . A wife caught her husband in bed with another woman, flagrant, in the act, skin to skin. The husband said, probably through pants of aroused sexual exertion: All right, go ahead and believe your lying eyes! It would be fun, were it not tragic, to compare the various ways the Israeli government and our media will attempt to blame the victims of this unconscionable attack for their own imprisonment, wounds and deaths. So what to do? Rosa Parks sat down in the front of the bus. Martin Luther King followed her act of courage with many of his own, and using his ringing, compassionate voice he aroused the people of Montgomery, Alabama to commit to a sustained boycott of the bus company; a company that refused to allow people of color to sit in the front of the bus, even if it was empty. It is time for us, en masse , to show up in front of our conscience, and sit down in the front of the only bus we have: our very lives. onflict” that would have ended in a week if humanity as a whole had acted in defense of justice everywhere on the globe. Which maybe we are learning! It would look like the granddaughter of Rosa Parks, the grandson of Martin Luther King. It would look like spending our money only where we can spend our lives in peace and happiness; freely sharing whatever we have with our friends. It would be to support Boycott, Divestment and Sanctions (BDS) against Israel to End the Occupation of Gaza and the West Bank (Google for details) and by this effort begin to soothe the pain and attend the sorrows of a people wrongly treated for generations. This action would also remind Israel that we have seen it lose its way and have called to it, often with love, and we have not been heard. In fact, we have reached out to it only to encounter slander, insult and, too frequently, bodily harm. Disengage, avoid, and withhold support from whatever abuses, degrades and humiliates humanity. It has always been about us; as we watch governments come and go. It always will be.